Square Enix's New Game with Cars. Transforming Robot Cars. Always nice to see game makers step outside their comfort zone, and bit by bit, Square Enix has been doing just that. The Tokyo-based game maker, best known for Final Fantasy and Dragon Quest, is working on a new car game called Gyrozetter. A new transforming robot car game. 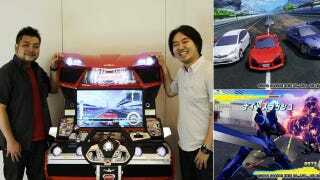 It's Unreal Engine powered, there's an upcoming arcade version, and there's also an upcoming 3DS version. The game's creators say it might be necessary to make an HD version—especially if Square Enix plans on bringing Gyrozetter overseas.